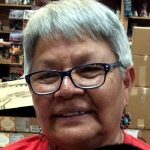 Hopi potter Ida Sahmie, born Navajo and married into Hopi, strikes a lovely balance between the two tribes in her pieces, incorporating her Navajo heritage in her Hopi pottery by way of traditional Navajo designs. Ida, born in the the Navajo nation, became a member of the Hopi-Tewa Pueblo when she married Andrew “Louis” Sahmie. 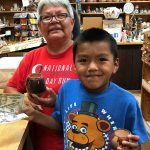 Her renowned mother-in-law, Priscilla Namingha (of Nampeyo-Namingha) fame, taught her to make Hopi pottery the traditional way, from picking and readying clay, to hand molding pottery in the coil method, to painting and firing. 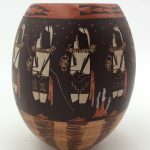 Interestingly, Ida was taught to weave by her own mother, but did not have the patience for it, and instead incorporates her Navajo heritage in her Hopi pottery by way of traditional Navajo designs, which are often based on the Yeis of her childhood and the memories of dances and ceremonies. 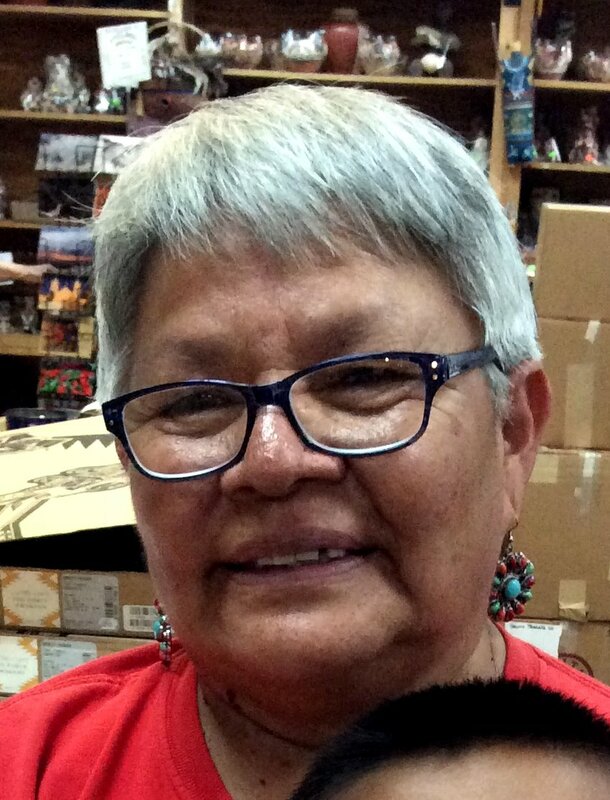 Born on May 27, 1960 near Pine Springs, Arizona, Ida currently lives within the Hopi Pueblo but still prefers to dig clay for her pottery from her Navajo home. She uses a mix of natural white and yellow clays, which results in a peach colored body. She often mixes a small amount of white clay with wild spinach to create the softer black slip often visible in her images. Her pottery is then fired outside in the traditional way, with ash and sand, then mounded over with sheep manure for intense heat. This process can take all day, and can only be accomplished when the weather is just right. 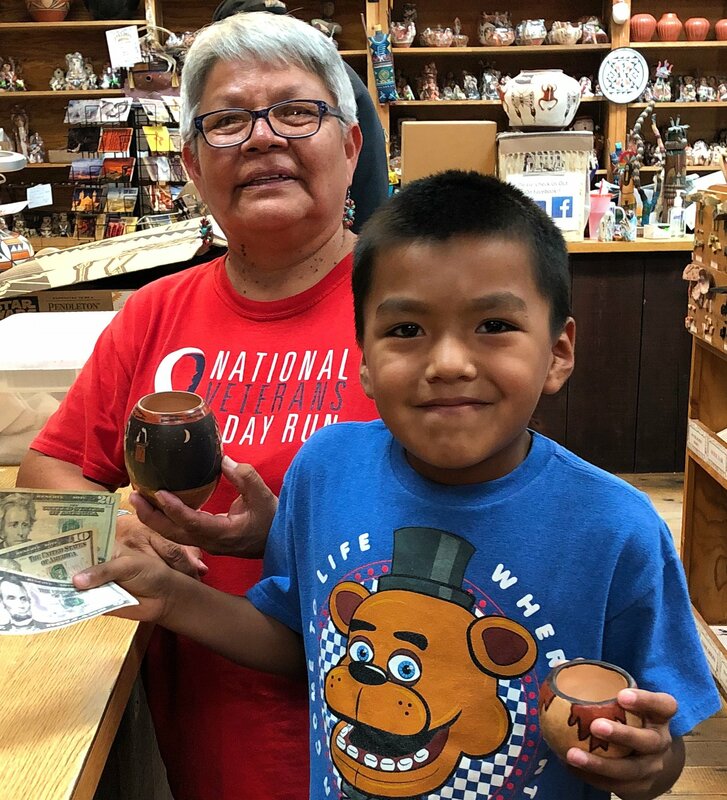 Ida’s process, truly a labor of love, has taken years to perfect, and she is continuing the family tradition by teaching her children and grandchildren to make pottery. We were fortunate enough to see Ida recently, and to meet her grandson, Andrew, who completed his first sale with us! We’re so privileged to know Ida and count her among one of our friends, and we can’t wait to see her tradition continued in the hands of her loved ones.